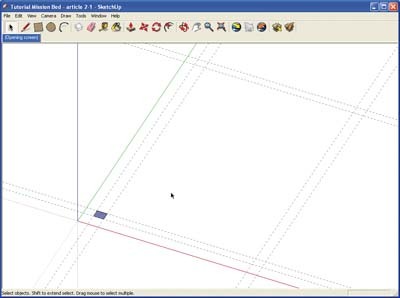 In the last article, I showed you how to construct a grid using Guides, which are created by the Tape Measure tool, and we got as far as drawing the outline of one of the feet of our mission-style bed. This is a bit like the preparation work you have to do for painting a room; necessary, but a little on the dull side. Now it's time to have bit of fun, and to start drawing 3D shapes! Well, almost: first, we need to draw the corresponding locations of the other three feet, and finish our grid. 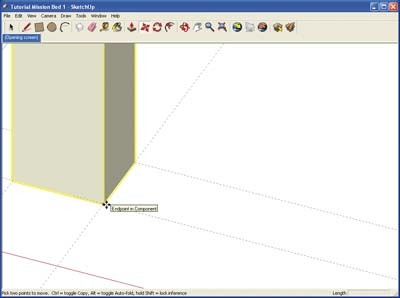 Using the Tape Measure tool, click on the guide to the right of the filled rectangle, and drag the new guide to the right. Without clicking again, type 1300 on your keyboard. Position another guide 90 to the right of that. In the other direction, parallel and away from the red axis, position two more guides, at 1900 and then 70 above that. Your layout grid is finished. Hopefully, when you first completed the outline of the foot using the Rectangle tool, it changed to show a coloured fill. This fill is called a face in SketchUp, and has to be present if we are going to create 3D objects. All objects in SketchUp are made up from faces and edges, and to create a face, all you need to do is draw a 'closed' shape of at least 3 edges (one where all the ends join up). Now, select the Push/Pull tool and hover the pointer over the filled rectangle. As you do this, the rectangle should change colour slightly and becomes dotted. Now click on the face with the pointer, and move the Push/Pull tool away from you and upwards. Magically, you should start to generate a three D shape, an extrusion as it is rather unpoetically known in 3D speak. Before you click again, type 840 on the keyboard, and press return. This number will automatically be entered into the VCB, and your 3D object (which is actually the first leg of the bed) should be finished at the right height. Don't worry if you don't get any part of this process right first time around, as it really is a case of practice making perfect. 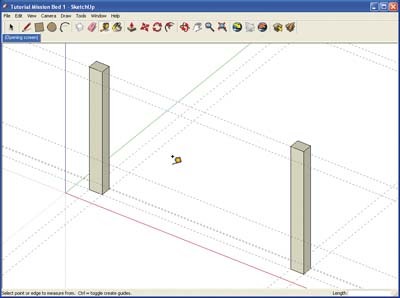 If you use the Undo command four or five times, you can do just that, as using the Push/Pull tool in SketchUp is very probably the most fun you'll get in 3D modelling! 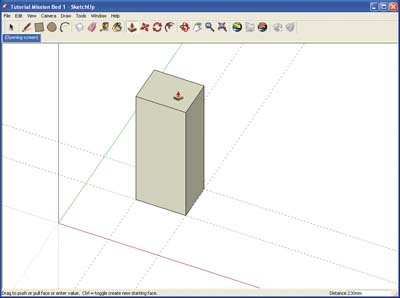 Back in the grown-up world, we now have to turn the object we have just created into what SketchUp calls a component. In order to do this we have to select all the faces and edges of the leg we have just created, by using a window select around the whole object.You should be able to see if you have successfully selected everything, because the edges will change colour as will the faces. Then, right click with the mouse anywhere on the object and a menu will appear with 'make component' as an option. If we select this, the Create Component menu appears, and at this point we can give our new component a suitable name. I chose Lower Leg, but call it whatever you like. Again, its a good idea to get the hang of this process, as we will have to do this with all the objects that we create which will eventually make our bed. 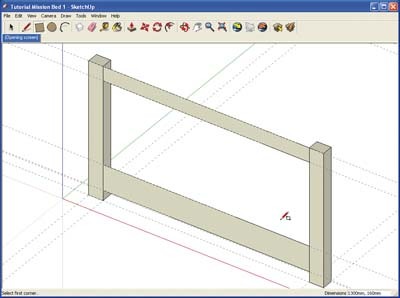 When you create things in SketchUp, they have a natural tendency to stick together or join up. To keep them separate, we need to make each new object into a component. At this point, the virtual woodworker really parts company with his earthly counterpart. Instead of creating a new leg adjacent to the first, you can simply copy the first one and put it in its place. To do this, it is important that we pick up the original leg at a point that we can use again when it comes to positioning its copy. 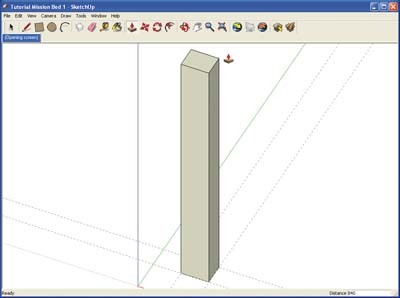 This is an important principle when you're moving and copying objects in SketchUp. You always need to know where you have got hold of something so that you can put it down accurately. 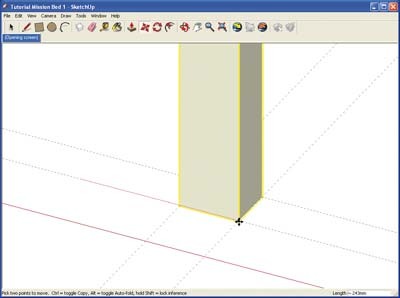 Luckily SketchUp helps us to do this by automatically selecting intersections, mid points and end points when you hover the cursor over them. 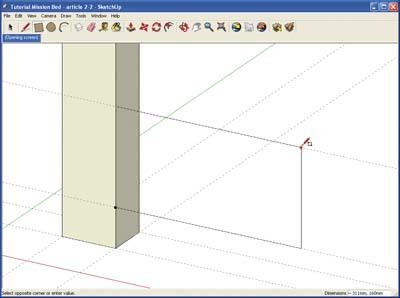 The cursor will change shape and a small text box appears next to it, telling you which part of the geometry you have decided to select. In order to do this of course you will need to zoom in on the base of the leg, so that you can really see what you're doing. 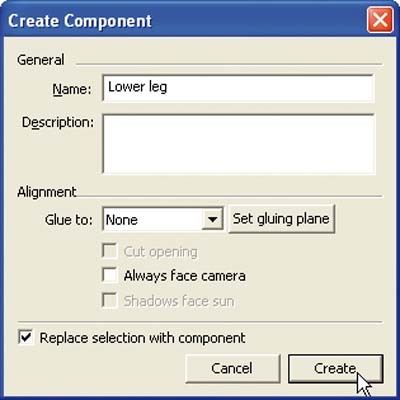 Click anywhere on your new leg component to select it (it's hard to remember, but you always need to have the Select tool selected in order to select something!) Now using the Move tool, click on your chosen pick-up point and drag the leg away to the right. As you do this press CTRL and you will see the original magically reappear in its place. Press CTRL again and it will disappear. This is what's known as a toggle action, and is something you will use time and time again. You may need to move the centre of the screen away to the right and zoom out. Sometimes it's easier to select the Pan tool as well. Again, this is a matter of practice, and learning to move around a 3D drawing quickly and easily takes a bit of time. A real help in this regard is the wheel mouse, as the wheel will enable you to zoom in and out much more easily. 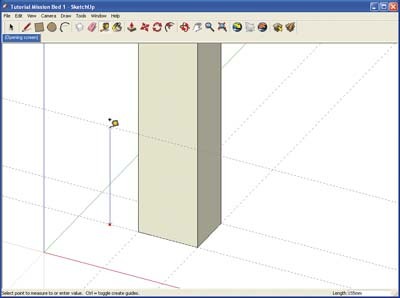 One thing to remember in SketchUp, which is to my knowledge unique in this, is to position your cursor over an object as you zoom, as not a lot happens if you don't. So far, we have been drawing things on the 'ground', and moving things around in a way that is a bit like the real world. The next step, however, is to start drawing things in mid-air! To do this, click on the guide that runs along the lower edge of the two legs with the Tape Measure tool, and drag upwards. The arrow that appears and lengthens as you drag should be blue, to denote that you moving along the blue axis, or upwards. Without clicking again, although you can release the mouse button, enter 65 to position your first vertical guide! Carry on, and position three more: 160 above the first, 525 above that and one at the tops of the legs, 65 above the previous guide. 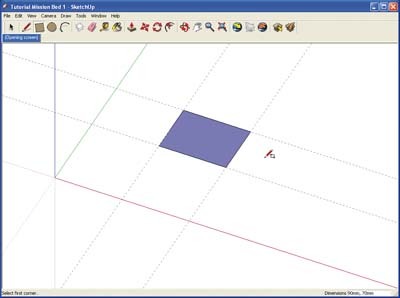 Finally, select the Rectangle tool, and making sure you click on an intersection at opposite diagonal corners, draw two vertical rectangles using the guides you have just drawn. You might find the rectangles are a bit reluctant at first, and seem to want to be horizontal. Just persevere, and again with a bit of practice, it becomes a fairly easy process. The most difficult thing to get the hang of is zooming in and out and panning, at the same time as you are drawing (or moving something). What is important to realise here is that SketchUp 'waits'for you to do your panning and zooming, and will carry on drawing where you left off.